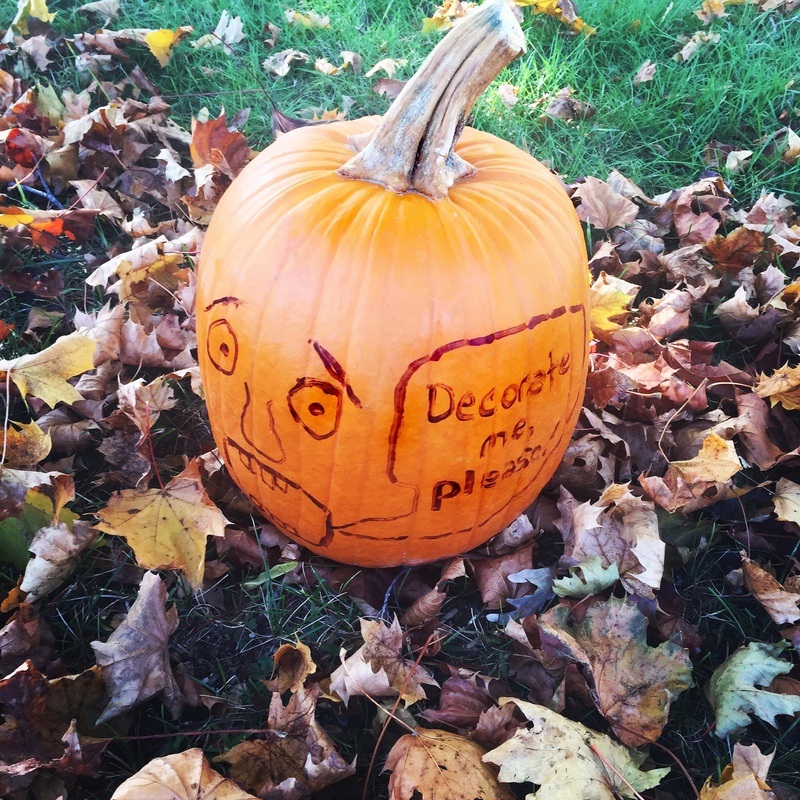 If you follow me on Instagram, you may have seen one of my pumpkins pleading with me to be decorated (don’t believe me? See the image below!). Nothing is sadder than a pleading pumpkin, so I had to oblige. 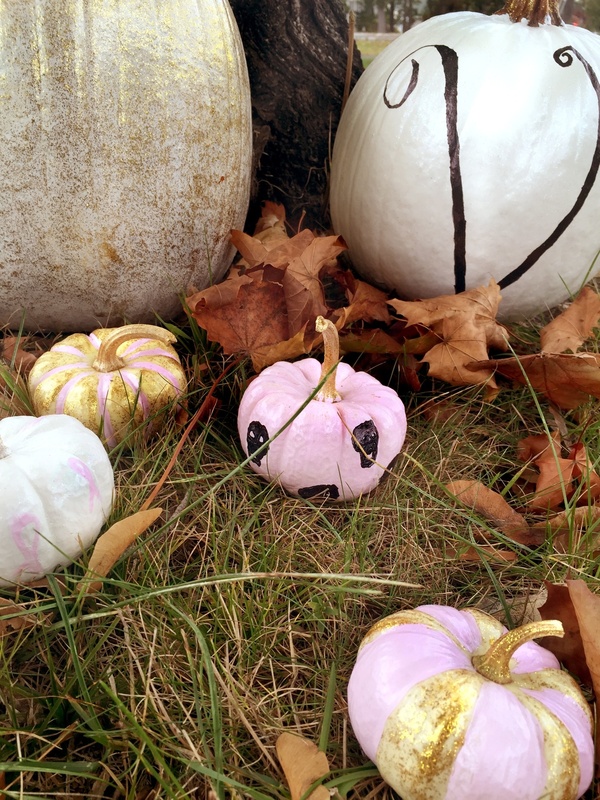 As promised, my pumpkins are making their way onto the blog. And guess what? They’re all decked out for the occasion. While I’ve seen a lot of great pumpkin decorating tutorials, from decoupaging (I want to try that next year) to copper pumpkins, I took a lax approach with mine. I started out with two large pumpkins, of the traditional orange kind, and four small white pumpkins from Trader Joe’s. In the interest of full disclosure, Martha Stewart I am not, and my success rate with DIY’s may be at a dismal 10%. There was that issue with carving a pumpkin one year…and trying to make a monogrammed mouse pad another. But you don’t know until you try, right? Now that I’ve disclosed my shortcomings, let’s talk about the pumpkins. I was actually pleased with how they turned out…despite buying the wrong acrylic colors and having to substitute ceiling paint from Behr at the last minute (thank goodness the ceiling in my home office happens to be white!). In honor of my grandmother, and Breast Cancer Awareness Month, I wanted to make a pumpkin for her. So I took one of the smaller pumpkins (which was already white, but ironically needed a coat of white paint), and painted little pink ribbons around it. Of course, for my own pumpkin, I painted it pink and drew skulls on it with black magic marker for an edgy finish. 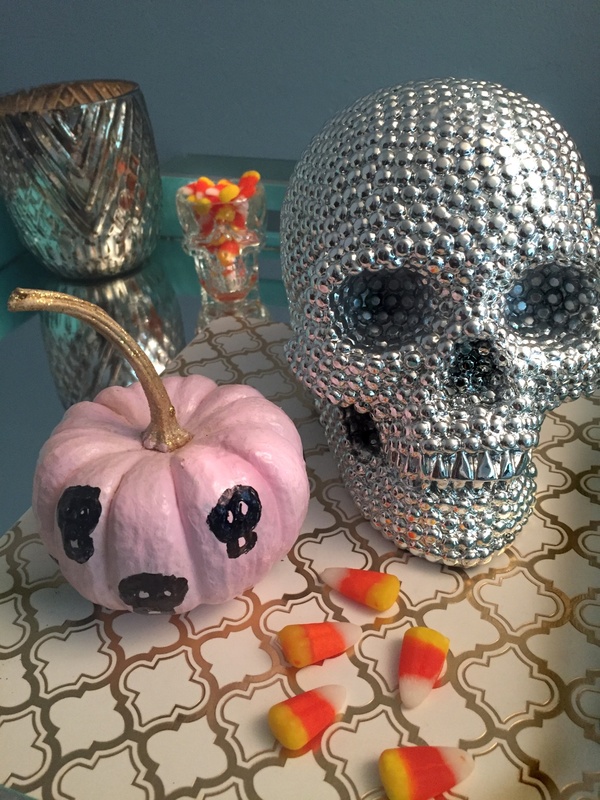 The two larger pumpkins are both wearing the Behr paint that’s not-for-pumpkins, and I added an acrylic crystal gloss to one and a gold sparkle gloss to the other. 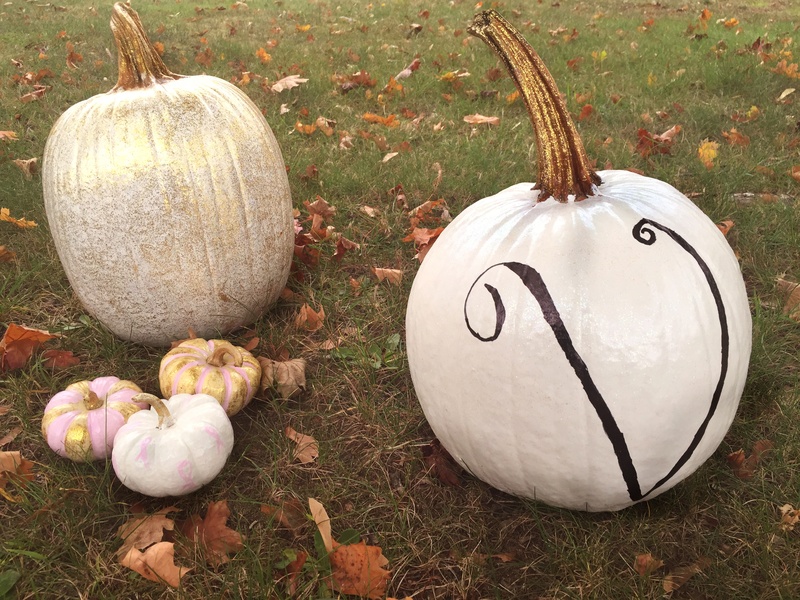 I decided to add a monogram to the plain white pumpkin and drew a free-hand “V” with the black magic marker (that calligraphy class I took came in handy). If you are planning to paint your pumpkins this year, I have some good news…you can’t mess up. I tried a few different designs, and what I didn’t like I just painted over. The paint, on the other hand, should be looked at carefully before purchasing to make sure that the bottle says “white” and not “crystal.” But fear not, even if you make a rookie mistake like I did, it seems like any kind of paint will work. And thanks to Behr for being a great color in my home office — and base coat on my pumpkins! Love the gold ones! gorgeous! love these!! I bought some pumpkins this week and have been thinking about painting them gold, but now you have me considering adding more color! Have fun with them, Sahra! There are so many great tutorials around the web. I like the color-blocking trend, polka dots, and making the little ones look like donuts by painting just the top of the pumpkin. I’m glad you enjoyed this post! I need to still decorate pumpkins this month has just flown by ! This month has gone fast, hasn’t it?! Don’t worry, you still have some time to get those pumpkins together. So cute! I love how creative pumpkins have become. oh what a great idea! I love painting! Makes the process more fun! 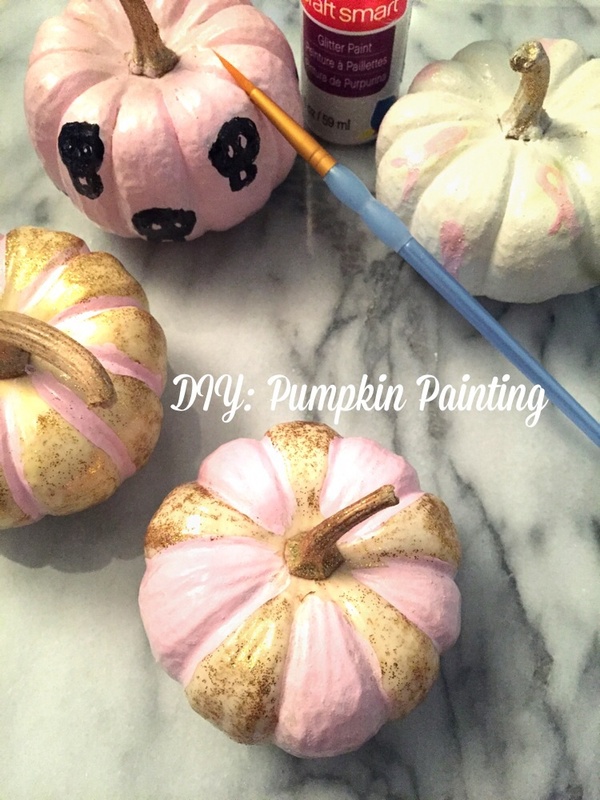 Love the idea of pink & gold painted pumpkins! Will try to do it too! Thanks, Tanya! They’re so easy to create. Such great ideas, Vanessa! I love the monogram one and the breast cancer awareness one, too! You’re always such an inspiration 🙂 I hope you have a marvelous day and start to your weekend, beauty! Thanks, Jalisa! 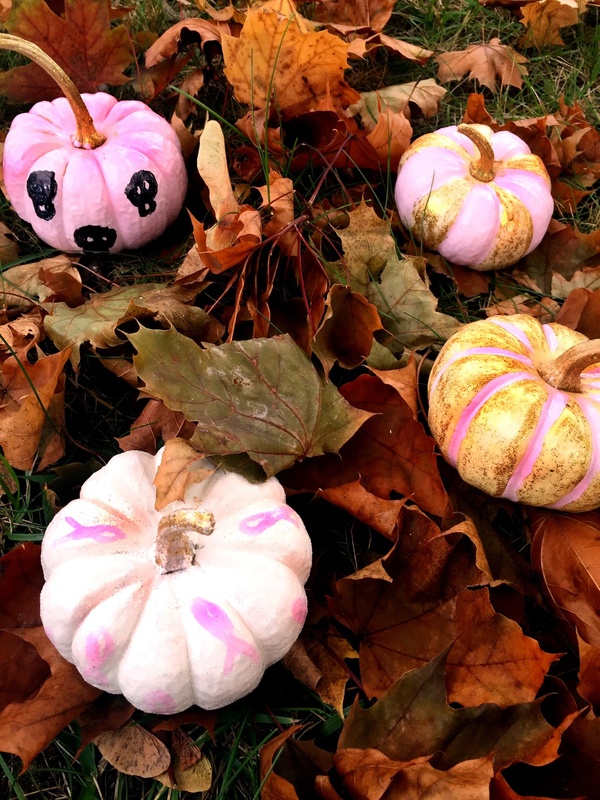 I had a blast painting these pumpkins, and I’m so glad you liked my creations. Hope you had a great weekend! These are so cute! I’m definitely gonna make some, thank you for the inspiration! Thanks, Esther! I’m glad you enjoyed the post and it inspired you to paint some pumpkins for Halloween. Can’t wait to see how they turn out! Thanks, Tristan! That would have been cute to paint spiders or ghosts on them. There are so many decorating tutorials out there that I wanted to try, but I would need a lot of pumpkins. Hope you find some time to do some decorating! How fun! I love the idea of painting pumpkins rather than carving them! Pink for breast cancer awareness is a great idea as well! Thanks, Annessa! My grandmother loved her breast cancer awareness pumpkin. I love how your pumpkins turned out. I think they look like they were done by a professional. I can’t believe you are a rookie. It sounds like it was a lot of fun to paint them. I might have to try this one year. For right now my kids like to carve them so we can get the seeds out and cook them. We will probably do this next week. Thanks for sharing your story and your useful tips with us. Have a great weekend! Thanks for your sweet comment, Kathy! This was my first attempt at painting pumpkins. I’m very pleased with how they turned out — but using ceiling paint as a base coat was definitely a rookie move. Carving pumpkins sounds like a lot of fun. I can’t wait to see how yours turn out. Hope you had a great weekend! I”m obsessed! I love the pink ones! So pretty! I LOVE the gold and pink ones! I’ve been loving painting pumpkins this fall! Your DIYs are all adorable! Thanks, Deasy! Painting pumpkins is so easy (and a lot of fun!). I’m glad you enjoyed the post and liked how the pumpkins turned out. 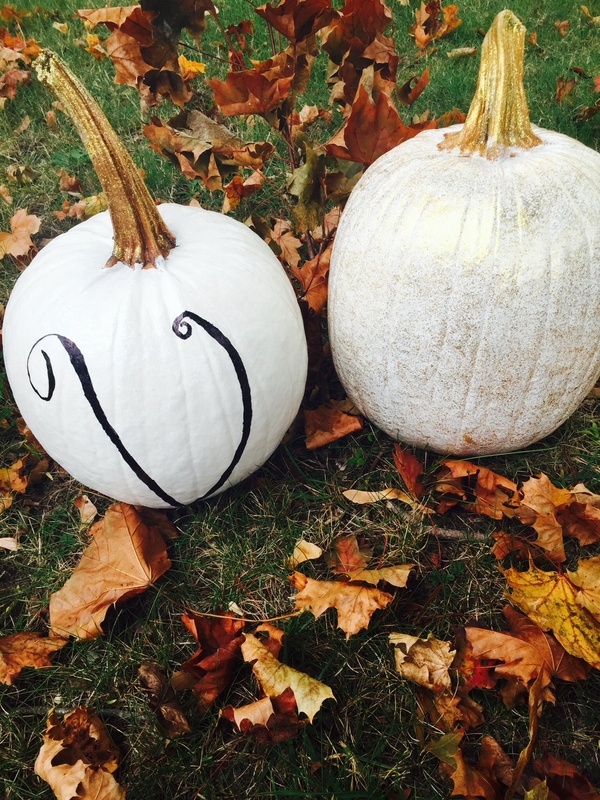 Your success rate with DIY’s must have improved with this pumpkin project since all the pumpkins are so pretty! I have never painted a pumpkin but would love to. It seems a fun activity. I’ll try to paint at least a tiny one this year. Have a nice weekend! Thanks so much, Danielle! I was pleased (and pleasantly surprised) with how they all turned out — despite having to use ceiling paint on some as the base coat. It was definitely a fun fall activity! Hope you find some time to decorate at least one before Halloween. Have a great week! Thanks, Karen! I thought the monogrammed pumpkin was fun, too. Oh how cute! Pink is my favourite colour so the idea of pink pumpkins are all ticks in my books 🙂 The one with pink ribbons is sweet and for a great cause. Thanks, Anna! I’m glad you enjoyed the post and liked my breast cancer awareness pumpkin. It must be so fun to paint and design the pumpkins as you like them! Love the one with the breast cancer awareness symbol, it’s pretty and meaningful! Thanks, Prudence! It was a ton of fun to decorate the pumpkins. And painting them is really easy if you are a DIY newbie, like myself. Love the idea of painting them. Never seen that done before. The silver ones are my favourite. Thanks, Ashleigh! Painting the pumpkins was a lot of fun. I’m glad you enjoyed the post. Your pumpkins came out awesome!!! Cool post!! Thanks, Amber! I’m glad you liked this post and I hope it gave you some Halloween decorating ideas. Have a great week!